Cash-Out Refinancing is a refinance transaction in which the borrower takes out cash beyond the balance of the existing loan. The additional cash can be used for a variety of purposes such as purchasing a second home or real estate investments, paying off high-interest debts, financing home improvements, or even paying for a college education. The use of the funds is not restricted, however, borrowers should be prudent in their borrowing and not take out funds they cannot afford to repay. One of the biggest problems that continues to plague homeowners today is that they took cash out of their homes while home values were high and later found they could not afford the payments. At the same time, home values declined to the point where they were unable to refinance to a lower rate. 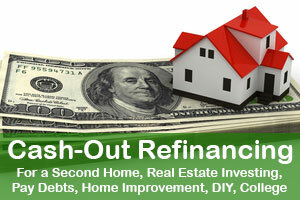 A popular use for cash-out refinancing is for investing in real estate. It typically takes some cash for the purchase and rehab of properties as you bring them onto the rental market, which you can achieve with cash-out refinancing. Another popular use for cash-out financing is paying off high-interest debts. The cash from a cash-out refinance can be used to pay off high-interest debts, and at the same time the new mortgage can be at a lower interest rate and at a shorter term than the existing mortgage. And of course, it’s popular to use cash from a home to make improvements and for DIY projects. Cash taken from a home spent to improve the home, resulting in a higher value, can be a win-win scenario. But in all cases, the borrower should evaluate the cost of refinancing against other factors, to ensure that the benefits outweigh the costs. The amount of cash that can be taken out will depend in part on the allowable loan-to-value ratio (LTV). In a recent change by Fannie Mae, effective December 13, 2014, that allowable ratio was reduced from 85% to 80% for a fixed rate loan on a primary residence single unit property. For an adjustable rate mortgage (ARM), the allowable LTV remains unchanged at 75%. It also remains 75% for fixed rate loans on second homes and investment properties and 65% for adjustable rate mortgages on second homes and investment properties. Investment properties of 2-4 units are limited to 70% for fixed rate loans and 60% for adjustable rate loans. For example, if you own a primary residence worth $200,000, you can now take out a fixed rate loan for 80% of that value, or $160,000. If your existing loan is $120,000, you will then receive the difference of $40,000, less the closing costs for the transaction. Closing costs on a cash-out refinance are the same as a rate/term refinance transaction. The interest rate on cash-out refinance transactions is generally a little higher than a rate and term refinance, but that difference depends upon loan-to-value and credit score. Borrowers with higher credit scores and low loan-to-value ratios may find there is no difference. Another option that borrowers may wish to compare before entering into a cash-out refinance is a home equity loan (HEL) or home equity line of credit (HELOC). The HEL and HELOC are second loans in addition to the borrower’s primary loan, and do not involve refinancing the existing loan. If a borrower has a low rate on the primary loan and cash-out refinancing would result in a higher rate, the home equity loan/line may be a better option (both also can be used as the primary loan in the absence of an existing first mortgage). Typically, closing costs on a home equity line/loan are lower than a refinance transaction. The rate on a HEL may be adjustable or fixed, and typically requires payback in monthly payments of principal and interest over a specific period of time. A HELOC typically has a variable rate and payments are often “interest only”. As a result, a HELOC may require a lump sum principal repayment at a specified time. Knowledgeable lenders can assist you in figuring out whether cash-out refinancing, a home equity loan, or a home equity line of credit is the best way to get cash from your home. If you are in Florida, Virginia, or Pennsylvania, Marimark Mortgage is uniquely equipped to help you. Mary Catchur, owner of Marimark Mortgage, has a CPA background that gives her the financial background to understand the intricacies of mortgages and cash-out options. Please take a moment to look at our testimonials, and contact us for your mortgage needs.